Elevated brain kynurenic acid (KYNA) levels are implicated in the pathology and neurodevelopmental pathogenesis of schizophrenia. 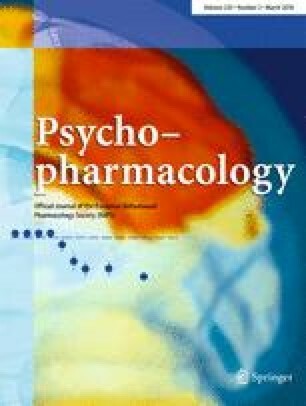 In rats, embryonic treatment with kynurenine (EKyn) causes elevated brain KYNA levels in adulthood and cognitive deficits reminiscent of schizophrenia. Growing evidence suggests that people with schizophrenia have a narrowed attentional focus, and we aimed at establishing whether these abnormalities may be related to KYNA dysregulation. To test whether EKyn rats display broad monitoring deficits, kynurenine was added to the chow of pregnant Wistar dams on embryonic days 15–22. As adults, 20 EKyn and 20 control rats were trained to stable performance on the five-choice serial reaction time task, requiring the localization of 1-s light stimuli presented randomly across five apertures horizontally arranged along a curved wall, equating the locomotor demands of reaching each hole. EKyn rats displayed elevated omission errors and reduced anticipatory responses relative to control rats, indicative of a lower response rate, and showed reduced locomotor activity. The ability to spread attention broadly was measured by parsing performance by stimulus location. Both groups displayed poorer stimulus detection with greater target location eccentricity, but this effect was significantly more pronounced in the EKyn group. Specifically, the groups differed in the spatial distribution of correct but not incorrect responses. This pattern cannot be explained by differences in response rate and is indicative of a narrowed attentional focus. The findings suggest a potential etiology of broad monitoring deficits in schizophrenia, which may constitute a core cognitive deficit. This work was supported by a Silvio O. Conte Center grant (P50 MH103222) and R01 DA035813 (B. Hahn). A. Pocivavsek is a trainee on K12 HD43489-14. We thank Ashleigh Wells and Taylor Radden for contributing to data collection. This work was supported by a Silvio O. Conte Center grant (P50 MH103222) and R01 DA035813 (B. Hahn). A. Pocivavsek is a trainee on K12 HD43489-14. Britta Hahn, Carolyn Reneski, Ana Pocivavsek, and Robert Schwarcz declare that they have no conflict of interest. The treatment of animals followed the “Principles of Laboratory Animal Care” (NIH publication No. 86-23, 1996) and was approved by the Institutional Animal Care and Use Committee of the University of Maryland School of Medicine.